Park Forest, IL–(ENEWSPF)– Snow might be covering the ground, but the Park Forest Baseball 2010 season is just around the corner. Boys and girls from 4 – 14 can register beginning on Saturday, January 16th, at the Village Hall in Park Forest from 1-5. Registrations continue on February 13th and March 6th from 1-5. On January 30th and February 27th they will be held from 10-2. Further details regarding fees, age divisions, and other pertinent information can be found at www.ParkForestBaseball.org. 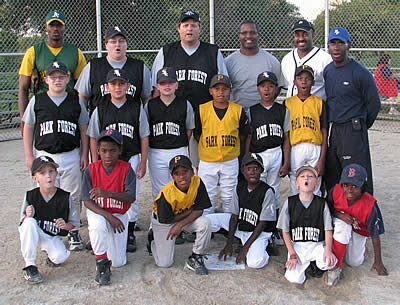 Last year, PFBB held the !st Annual Park Forest Thunder and Lightning tournament for 8 year olds and under. This season the tournament will be run again, with additional ones for 10U and 12U. Our 4-6 years olds will participate again in the Richton Park T-Ball festival. The tournament teams will also be participating in several other tournaments in the South Suburbs. PF Baseball also runs one of the concessions stand at the July 4th celebration and has a table at the Park Forest Main Street Nites held on selected Wednesdays in the summer. There are several ways in which you can help support PF Baseball even if you do not have a player in the league. The easiest way is to make your search engine GoodSearch.com and enter Park Forest Baseball as the charity/organization to support. Every time you use this search engine, a penny is donated to out account. This may not sound like much, but the more people who search on the site on PFBB’s behalf, the quicker the money adds up. You can also use GoodBuy.com to make internet purchases and a specified amount from the many, many merchants will be added to our account. Another way we raise funds is by participating in the Jewel Shop and Share program three times throughout the season. We are issued certificates that are used on specified days when shopping at any Illinois Jewel store and we receive 5% of the total sales. Please watch this site in the upcoming months for the dates and certificates. If you have any questions on the fundraising tools or baseball, please contact Al or Mary Kay Joens at 708-503-1944 or [email protected].